This is the second in a series of posts examining the different cuts that can be used to create effective kinesiology taping applications. The “Y” strip is the most widely used of all of the cuts, especially when applying Kinesio Tape for sports injuries. It consists of a length of kinesiology tape with a single longitudinal cut beginning at one end and continuing for a specified distance along the center of the tape. The other end of the tape is left intact. 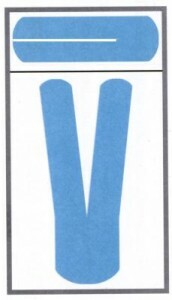 When the two “arms” of the tape are separated and applied along the outer borders of the muscle belly, it resembles the letter “Y.” The “Y” strip may be used alone or in combination with one or more “I” strips for added benefits. 2. Inhibiting the activation of an overused or injured muscle to protect it and help it recover. 3. Mechanical correction of unsafe or inefficient movement patterns. 4. Reducing pain and inflammation. 5. Softening scar tissue, reducing adhesions and pitting, making scars softer, flatter and more pliable. Cut a piece of Kinesio Tape, approximately 2″ longer than the muscle. Beginning cutting longitudinally down the center of the tape, leaving the final couple of inches intact. Round the corners of all cut edges to help prevent the corners from catching and loosening prematurely. A 3-tail “Y” strip can also be used. In this case, two longitudinal cuts are made in the tape, creating three strips of equal width. The base of the “Y” strip should be applied slightly above or below the belly of the muscle being taped. The two tails of the “Y” are applied along the outer borders of the muscle belly. For a 3-tailed “Y” taping, the center strip is applied directly over the belly of the muscle. For most tapings, both the base and the tails of the Y are stretched as the tape is applied, except for the final 1-2″. The amount and type of stretch, however, can vary considerably depending on the purpose of the taping. This more advanced information will be covered in future postings.When applying tape with a stretch, be sure to follow behind the area of application, rubbing with a thumb or finger to activate the adhesive.